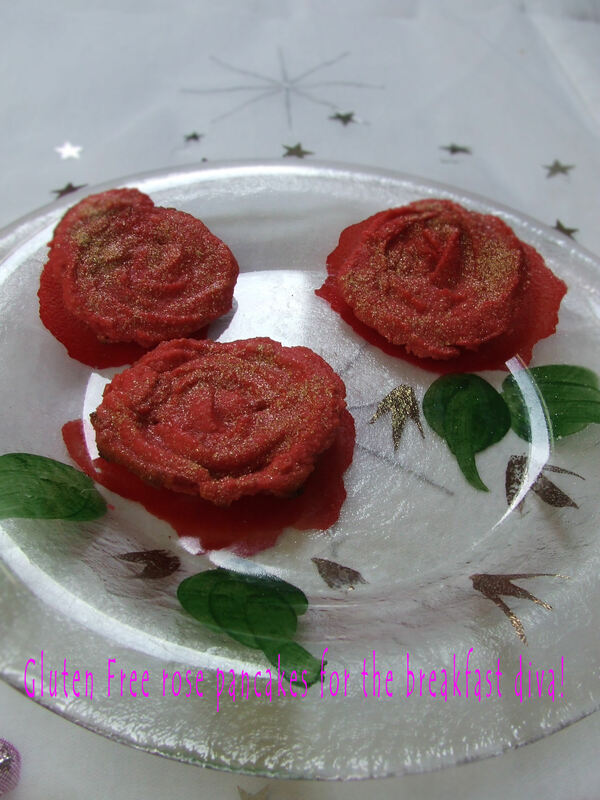 talkhealth > Blog > 2014/10 > Gluten free, cow’s milk free rose pancakes for the breakfast diva! Make these for a special occasion – gluten and cow’s milk free pancakes with an extra special flair for a birthday or wedding breakfast, of in fact you can make them plain for a tasty cooked alternative to kick start the day. I was asked to review an almond flour by a manufacturer Sukrin who donated the flour for the review. I liked the flour, it was tasty and worked well for the recipe. For other manufacturer recommendations such as suitable for low carbohydrate and paleo diets, this may well be the case, however I don’t advocate removing the carbohydrate totally from from your diet or having a very low intake of carbohydrate for healthy people – carbohydrate is food for the brain and fibre containing (or wholegrain) carbohydrates are prebiotic, food for your gut bacteria. If you are having gut symptoms changing your types of carbohydrate may be a better option that stopping eating carbohydrate altogether – just ensure you have a medical diagnosis first before making any changes to your diet and request a referral to a dietitian! We do now know that changes to diet can affect the variety and number of gut bacteria that live in your digestive tract and we do not yet know what the effects low carbohydrate diets have on long term digestive health. Our gut bacteria help with producing vitamin K and produce short chain fatty acids which help to keep the tract healthy. Most dietary changes Dietitians advocate are to identify a particular food intolerance culprit – this not only has benefits in reducing symptoms, but also means you can continue to have as varied a diet as possible. a few drops of food colouring and edible gold glitter if you really want a decadent treat! Mix the eggs into the almond flour, add the syrup and nut milk to the mixture then add the the food colour. Spray oil into the pan and using a piping bag pipe swirls of the mix into the pan and fry until the base is cooked and then finish the cooking in an oven at gas mark six for 5-10 minutes. 3 Responses to Gluten free, cow’s milk free rose pancakes for the breakfast diva! These look absolutely fantastic, so pretty. I’m not sure mine will turn out the same! But I was wondering if I would be able to swap the almond flower for rice flour and the hazelnut milk to coconut milk because I have a nut allergy? Thank you for your lovely comment. Of course you can try with rice flour and alternative milk – you might need to alter the ratio of flour to milk to achieve the correct consistency. If you are having problems perhaps a small amount of xanthan gum mixed into the flour before adding the milk might help – obviously ensuring it is not contaminated with nuts! I thought there might be a consitency issue. I have heard of xantham gum, I will be on the look out for it. Thank you for the suggestion.